I was inspired to start flower painting at the age of six, having been left a book of wild flower water colour illustrations which my grandmother had painted in Dorset in the early 1930’s. I copied these paintings time and again, until one day my father asked why didn’t I “have a go” using living plants from the garden. So, I did – and I haven’t looked back. At the tender age of six, I won first prize in a Welsh infant’s art competition for my depiction of a birthday cake – and I still have the book I won! Since then, I have attended many local and national art classes in water colour, pastels and botanical illustration. In 2003, I studied for the Diploma in Botanical Illu stration from the English Gardening School at the Chelsea Physic Garden. I gained this diploma two years later and began teaching botanical illustration to groups in and around Monmouth. 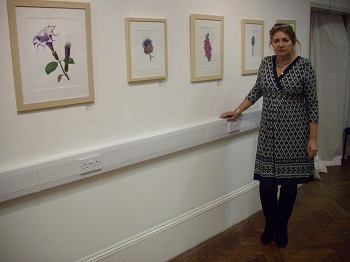 My work has been selected for exhibition at the Society of Botanical Artists annual exhibition in London. Unfortunately, at the time of the 2010 exhibition, I had just broken both my ankles, so attended in a wheechair! 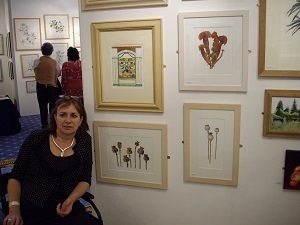 I have also exhibited in a number of local galleries and shared exhibitions. My paintings have found themselves as far afield as Chicago, Japan and New Zealand. The Grant Bradley Gallery in Bristol asked me to showcase my work. 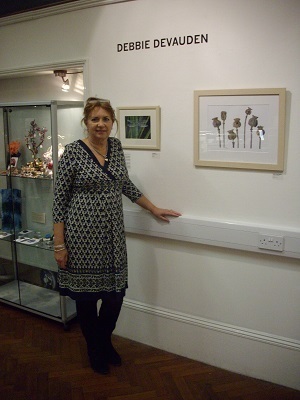 I had a solo exhibition at the Court Cupboard Gallery, near Abergavenny. I regularly attend courses with various tutors, firmly believing that you can always pick up tips and new concepts and I belong to the Gloucestershire Society of Botanical Artists . In August, 2013, I was invited to take part in the Louise Elliot show on BBC Radio Wales. This was a really new experience, I had never "painted on the radio" before. In the end, it went really well - click here to listen to the show!